Last week I found this recipe on This Week for Dinner’s website. I thought this was a genius idea because you don’t need to make a separate crust for the pie. I don’t know if I’ve attempted to make homemade crust. Usually I use the store bought variety. This pie is easy to put together. Although it called for peeling the apples, I left a little peel on which added color when the apples peeked out of the crust. Which was pretty cool looking. This is not a traditional pie. 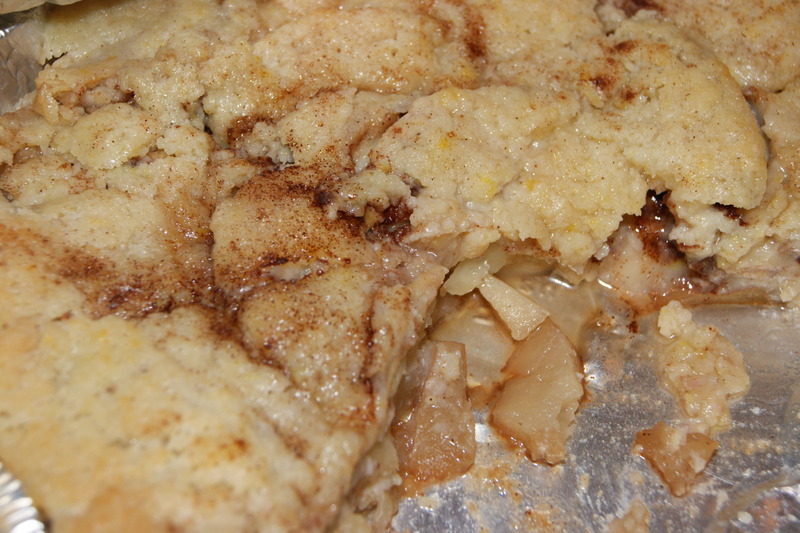 Instead the crust is more like a cobbler then apple pie like. This pie would be good with whipped cream, vanilla ice cream, or even cinnamon ice cream. Yum! 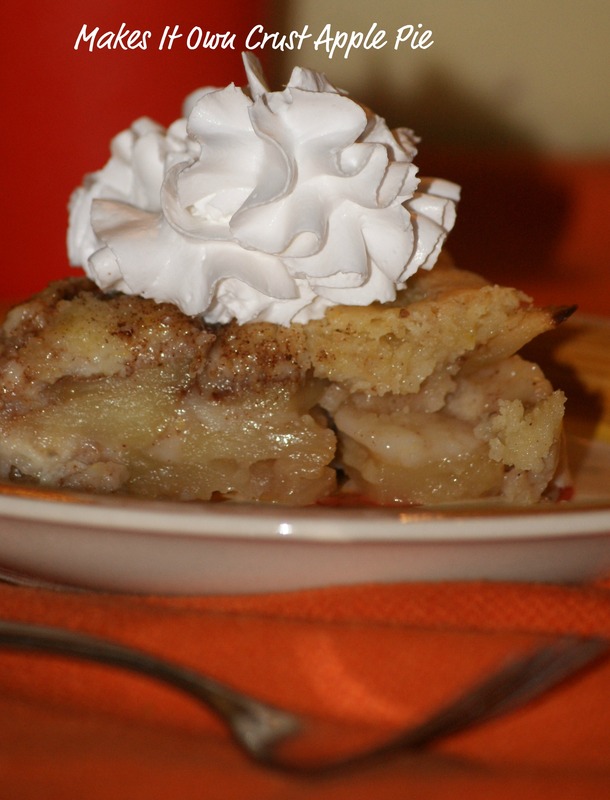 Fill a pie plate or any 8×8 casserole dish/pan with sliced apples. Only the center can be slightly above level with the top of dish or the topping will spill over the sides, so don’t get carried away. Mix together the butter, sugar, flour and egg. Pour the mixture evenly over apples, sprinkle with more cinnamon sugar if desired. Bake at 350 degrees F until deep golden brown – around 40-45 minutes or so. Today is Thanksgiving and I have a lot to be thankful for this year. God showing me a talent. This talent has allowed me to see the beauty of his world in a way I’ve never seen it before. Laughter – Hearing the boys laugh brings joy to my soul. My health – During June I suffered terrible headaches. For three almost four weeks I had headaches that were persistent. Luckily a trip to the chiropractor helped relieve them. Then in September and most of October I had a persistent cough. Fortunately for me both are better. God giving me 2 boys who are bright and surprise me with their knowledge and insight about the world around them. Now onto the recipe. On Sunday, my father-in-law informed us he was cooking a chicken for Thanksgiving. There was going to be only 6 of us for dinner and he didn’t want to deal with all the left-overs. The family convinced him that he needed to make a turkey. I wanted to help make the dinner so I decided what I was going to bring. 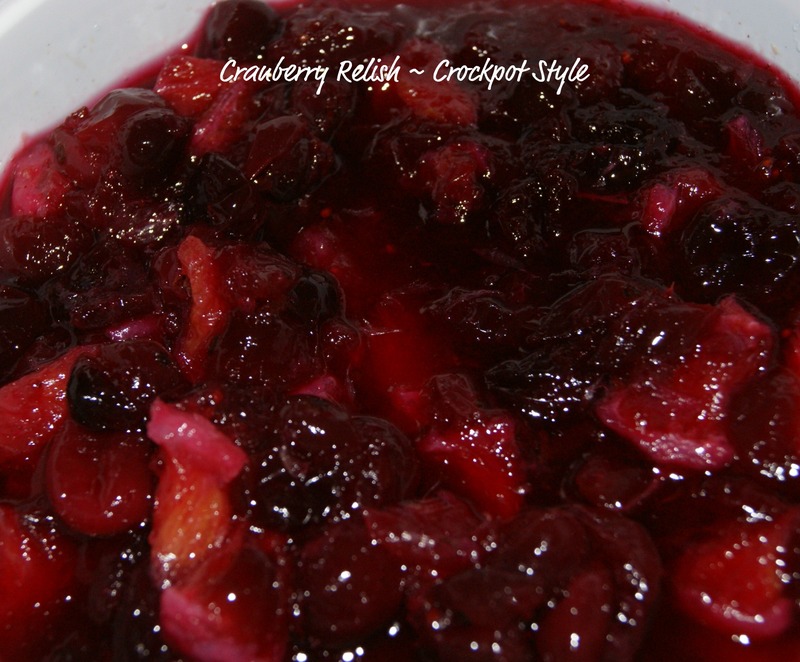 One of them items was going to be homemade cranberry relish. Yesterday I stumbled on this recipe. I hope you had a great holiday! What are you thankful for? This post is linked up to Eat at home’s Ingredient Spotlight. In my previous post, I listed some of my favorite cookies to bake that are on my blog. 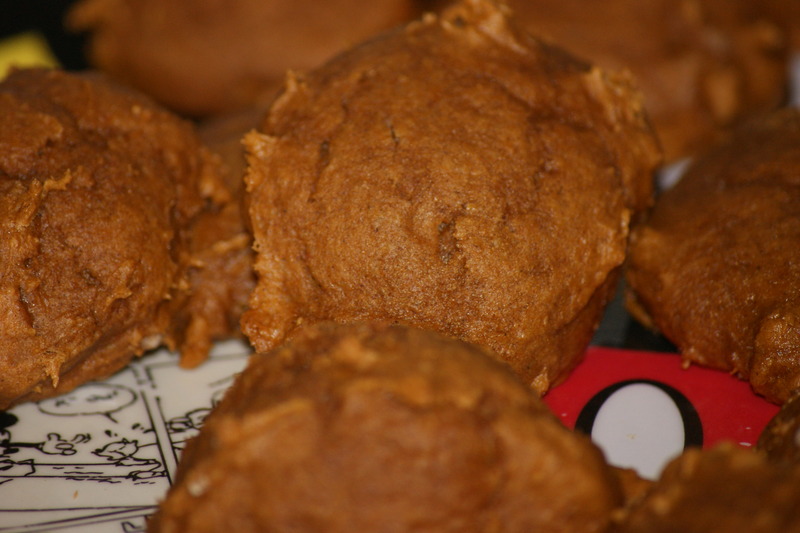 Here are some other favorite cookie recipes that are on other blogs. My goal this Christmas season is post them on this blog so that I have them readily available during next year’s baking season. Santa’s Whiskers Cookies – If you like coconut and maraschino cherries, this is the recipe for you! Brown Sugar Jumbles – What’s not to love about these cookies, they are oatmeal and m&m’s cookies rolled into one! Yum! Candy Cane Snowballs – Crushing candy canes is a good way to get your frustrations out. Or you could put the candy canes in a baggie and let the kids crush them. Andes Creme de Menthe Cookies – I already have the Andes Creme de Menthe pieces with my cookie baking supplies. The Imaginative One loves Andes mints so this is one of his favs. When I was a teen, I lived with both my mother and my grandparents. There are several Christmas memories that I treasure. One is my grandma and her trees. She loved teddy bears and would put up several trees with just her teddy bear ornaments on it. Then there we would put up the traditional tree. I really wish I was into photography then because I would love to have pictures of her and her trees. The other memory is her baking and making candy. She had a bench in the kitchen that I inherited from her. After she would bake a batch or two cookies or make the candy she would put it on the bench. I was not suppose to touch any of the goodies because they were to be given out as Christmas gifts. My mom helped her with the baking and making candy but I didn’t. I don’t remember if it was because I was a teen and didn’t want to or if she didn’t allow me to. Now I wish I did help her make those goodies and again I wish I had photographs of all the goodies. I got married in 1999 and moved out of the college dorms. During Christmas I picked up the tradition of making goodies for Christmas. And I’ve done it ever since. While my grandma was dying in 2008, we spent the days leading up to Christmas in the nursing home keeping watch over her and praying. When I was unable to be at the nursing home, I was at the house baking up goodies and then bringing them to the nursing home to share with family members. Grandma ended up passing away on Christmas Eve right about the time the Christmas Eve service started at my church. It was only fitting she died during the holiday season because she loved it so much. Most of the Christmas baking I do myself but the boys are allowed in the kitchen for some of it. They do help for the most part. But their attention span is of a flea sometimes when it comes to this kind of stuff. Will’s favorite part of helping is cracking the eggs and beating the yolks with a fork. If I’m making peanut butter blossoms which is their favorite kind of cookie, they are all about putting the Hershey Kiss on the cookie when it comes out of the oven. Those are memories I want them to have so hopefully they can pass them onto their kids. So as the Christmas baking season begins for me, I want to list some of my favorite cookies I’ve made and will make once again. I use my grandma’s Kitchen Aid stand mixer to make the dough for all the cookies and have used it since 2008. What are some Christmas memories you treasure? I’m about simplicity especially when it comes to baking or recipes. So when I saw this recipe in my inbox, I knew I needed to make these cookies. Fortunately I had both ingredients at my house. These cookies did not disappoint me. They were delicious, moist, and easy to prepare. Line a cookie sheet with parchment paper or spray it with nonstick cooking spray. Dump the cake mix in a bowl. Dump the pumpkin on top of the cake mix. 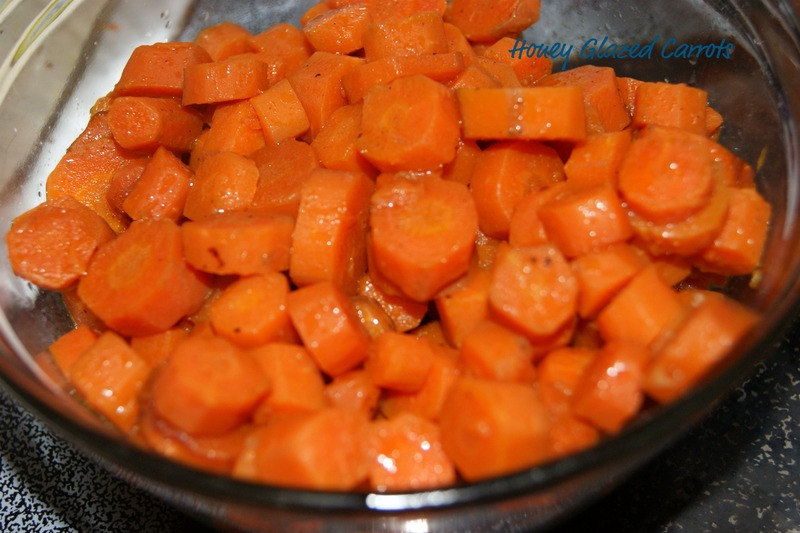 Drop by heaping tablespoons about 2 inches apart on prepared cookie sheet. Bake at 350 for 13 to 15 minutes. The dough does not freeze well.